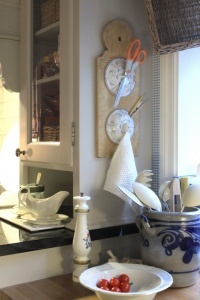 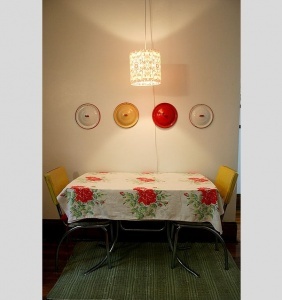 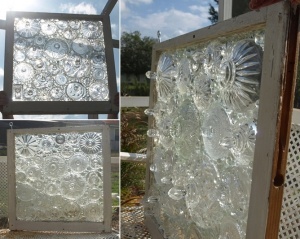 Etsy Shop ARTful Salvage has created a mosaic window by cleverly upcyling stray glass lids. 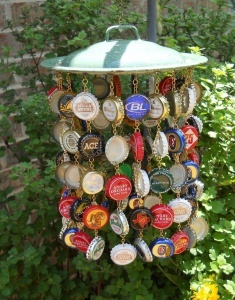 This is truly a masterpiece. 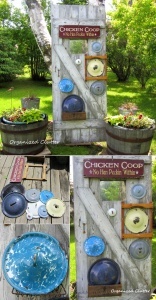 Carlene at Organized Clutter has created a feature for her garden by recycling a barn door and installed old enamel lids on it to create a vignette. 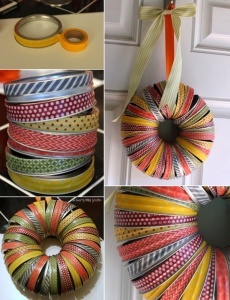 Katie at The Crafty Blog Stalker has shared this creative idea of covering canning lids’ outer edge with washi tapes in fall colors to create a fall wreath. 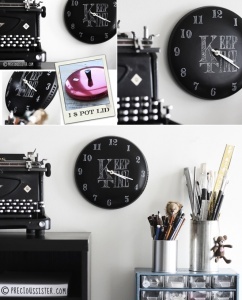 Precious Sister Blog has shared a super cool way to recycle a pot lid into a chalkboard wall clock by using chalkboard paint and a clock kit. 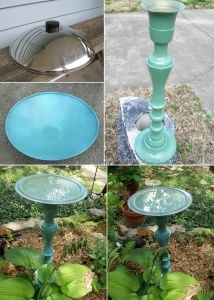 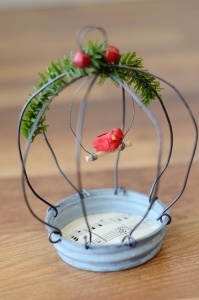 Gail at My Repurposed Life has painted an old candle stick and a recycled pot lid and the result is this beautiful bird bath that is now a part of her garden. 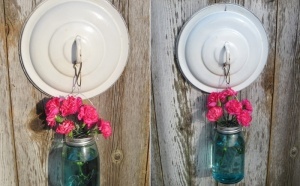 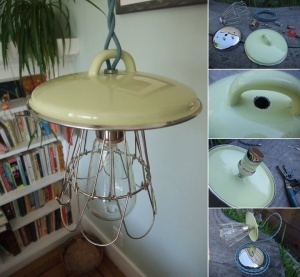 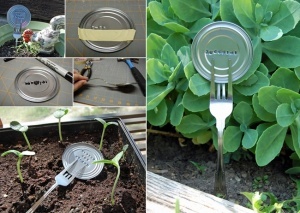 Etsy Shop Treasure Again has shared a beauteous yard art where enamel pot lids are used as mason jar vase hooks to create art that you can display in your yard. 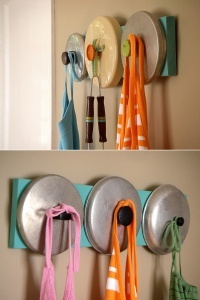 Ramona Copley at Pinterest has shared an adorable snowman made with white pot lids. 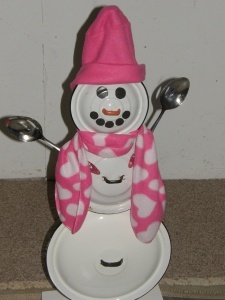 She has used three white pot lids in different sizes to create a snowman combined with a cute pink fleece cap and a pink and white polka dot scarf. 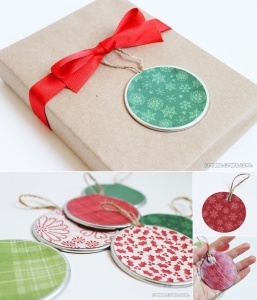 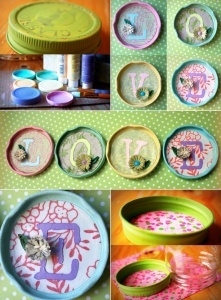 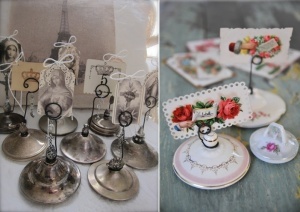 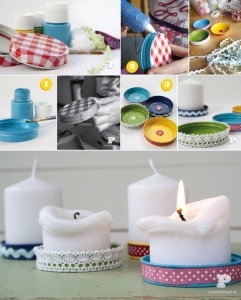 Jill at Create Craft Love has crafted some really cool gift tags using mason jar lids, scrapbook paper and mod podge. 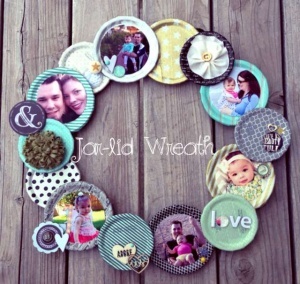 Megan Hoeppner has crafted this cute photo wreath using jar lids and washi tape.